I must share a testimony. I have been feeling very much like I am In a “season” of growth in my life. This year has not been an easy year (and I know for others it has been more challenging than mine), but I really have been pushing through it, fighting through it sometimes. I’m prone to be self dependent, and just down right stubborn. Trust me when I tell you, a hard head makes a soft behind 😨. But, truly my goal at the beginning is this year was to PRAY my way through this year. Not knowing what it will bring. I felt so compelled that I needed to do this because I would need the strength. Some friends of mine and I took this challenge to make Prayer closets. Cleared out the clothes and clutter. Made it comfortable, and quiet. 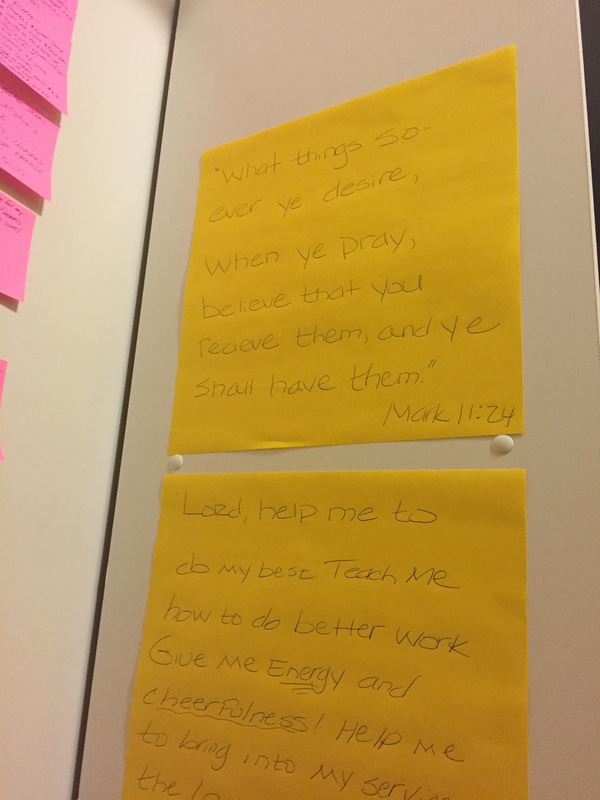 I began to post Gods promises all around the wall in the closet. My bible, note book and sticky notes were there, and something to write with. Daily I started spending my mornings, sometimes afternoons and soon evenings in that closet. My husband would be looking for me, my kids would be calling me, “MOMMY!!! !”, and eventually they knew, “she must be in the closet“. Sometimes my little ones wanted to come in with me and sit there to see what the closet was all about. They wanted to pray too. It touched me one day when my daughter Angel came to me and said, “Mommy, I need to go in the closet to pray😔”. I’ve prayed, cried, yelled and praised in that closet….and I’ve even slept in that closet, sometimes for hours, Just not wanting to leave that time with God, or waiting on Him to answer a desperate need. I have all kinds is sticky notes with the names of friends, family, neighbors, strangers, and concerns written all over. I’ve seen Him move in their lives and answer prayers. But….the most precious thing for me in that closet has been the promises placed in there. When I first started, God led me to post certain promises on the wall. I didn’t know why, I just did it. Then everyday I would look at those promises, and repeat them to myself. It Got to the point that I wouldn’t even need to read them, I knew them by ❤️. I had known scriptures by ❤️, but I can’t say that they had power like now. Then….as the year drew on, the word became active in my life like it never has been before. When I was faced with trials, struggles, depression and fear …..the WORD would flow from my mind, to my lips. When I was in the midst of wanting to reply in a negative way, or be fearful, it would just speak and it was clear and to the point. I found myself in amazement at how QUICK the word presented itself to my situations. It was like second nature and I stopped one day and thought…..I hear the voice of God speaking to me directly, clearly and without a doubt it had the POWER to STOP me dead in my tracks, or PUSH me to move past, or look up and live. I now realized that this was what it meant to have POWER through the word. I was living as a Christian, but missing out on Christ living in me in this way. I had read His word regularly and was an active member is the body, I prayed and had devotions…..but now praying with POWER of Gods word and intentionally praying for it to be made ALIVE IN ME. This closet has given me a relationship with Christ that I have never had before. It has brought the word ALIVE in my heart and given me a place of refuge and strength. This year is not over, and I know many struggles are still yet to be faced. But, I know that I have a advocate with the father. Many of those promises I had never seen before and I have been able to give them to people God has put in my path. Like He knew I would need them to give to them. This PRAYER time has been life transforming and if you haven’t already done it….get a closet, a corner, a basement or some kind of area to spend quality time in prayer with Jesus. Begin to surround yourself with HIS WORD. It’s not the closet that has the power, But the time you spend with God Himself, that will change your perspective, your motive, your Identity, your situations and give you the ability to stand and watch God move in ways you’ve never seen Him move before. And let me be clear, prayer doesn’t mean you won’t go through stuff and that if you ask God not to suffer, that you won’t. I realized that there were going to be mountains that He would not move out is my path, but he would give me strength through His Word to climb. There would be people He would not move, but give me grace to love them inspire of, circumstances He would not change, but rather change me as a result. When you know you have HELP and a ADVOCATE, you will make it through.